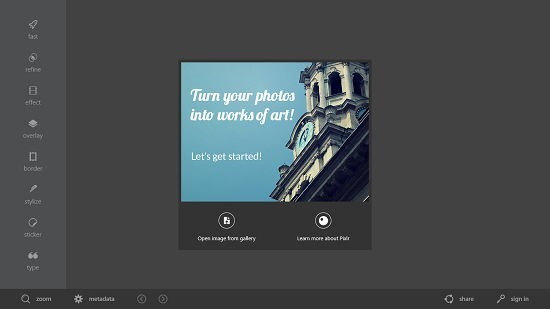 Autodesk Pixlr is a free image editor app from Autodesk which allows you to edit images on your Windows 8 or 8.1 device. Running the app on your device will present you with an interface which allows you to choose the image which you wish to open up for editing. The task is a very simple one, and all you have to do is to choose the image from your gallery, click on it and it will be opened up in the app. Autodesk Pixlr is a very lightweight image editor which makes for a great free tool to give a professional feel to your images or photos. Autodesk Pixlr is available for free from the Windows App Store. When you install and run Autodesk Pixlr on your device, you will be presented with the below screen. In the above screen, you can click on Open image from gallery button to be presented with the familiar file browser interface from where you can click and choose the image that you wish to open up for editing in the app. When you have chosen the image that you wish to edit, you will be brought to the editor interface with your image opened as can be seen in the screenshot attached below. You can choose from various editing effects in the bar on the left side of the editor page. 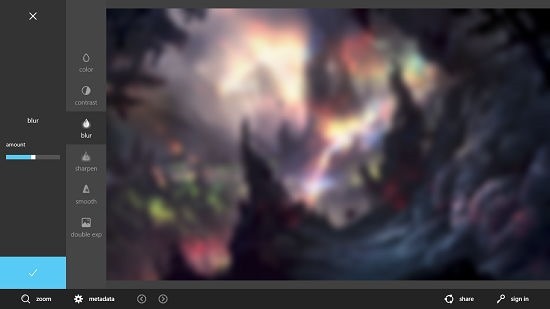 For instance, I have shown the application of blur effect in the screenshot below which is available under the refine menu. Similarly, from under the stylize menu you can apply filters to your image as can be seen below. In the same way, you can play around with other effects included in the app as well. 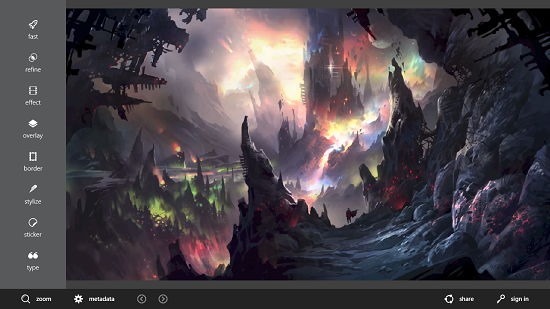 This concludes the main features of Autodesk Pixlr for Windows 8 and 8.1. Autodesk Pixlr is a well-designed lightweight image editor app which will serve almost all your needs and will allow you to give a professional look and feel to your images or photos. The app can be grabbed for free and to do so simply head over to the link below!